Come meet us in this historical public school that dates back to the 19th century. It was built at a time when the new French government had decided to encourage education for all children. We will help you discover what everyday life was like for children in rural France at that time. The instructors’ living quarters have been reconstructed using furniture from that era. In this building you will find numerous school books edited between 1880 and 1970…but only in French. Only children who stayed in school after the age of 13 were able to study English, and these were very few. 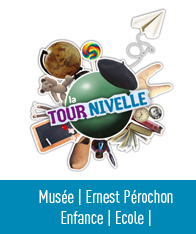 One exhibit is dedicated to the local hero Ernest Pérochon. He was a former student at the Tour Nivelle who later became a teacher himself as well as a writer. He received the prestigious Prix Goncourt in 1920. This literary prize is awarded to the greatest French language writers. (For the moment it is exclusively devoted to books in the French language, but this is expected to change soon). After leaving the teachers’ lodging you can play with the 19th century games on the playground. Next enter the 1900 classroom. This has been reconstructed using period furniture: wooden desks, wall maps, a blackboard…..You can seat yourself at the desk of one of the 50 boys, aged 6 to 13, who attended this school. Girls were in a separate classroom. Admire the handsome maps (The United Kingdom can barely be seen on some of them). You will see scientific posters and French history charts. Obviously, little attention was given to reality outside of France. You may use the old-fashioned pens with nibs to copy the moral quotation of the day onto your paper with purple ink found in the ink pots by the pen holders. Written by the teacher on the blackboard, this sentence helped educate future citizens. All summer long various cultural events and festivities let visitors get the most from this school/museum. Enjoy yourselves!! Have a good time! !